Air freshener dispenser features an attractive design that coordinates with a wide array of decor to help you discreetly maintain a fresh, welcoming environment. An advanced oxygen power cell controls the fragrance and odor-neutralizer dosage to ensure consistent fragrancing more than 30 continuous days. LED status light informs you when the system is operating, batteries are depleted or the refill cartridge is empty to ensure proper operation and performance. 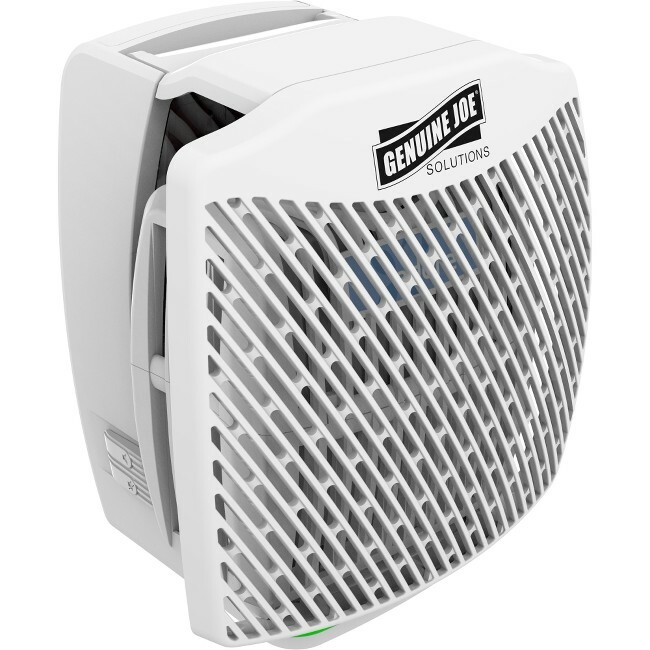 Wide spread dispenses a fine mist that dissipates evenly for efficient use in rooms up to 6,000 cubic feet. Dispenser is perfect for common areas where unpleasant odors can be found, including restrooms, lobbies, offices and more. Dispenser is designed for use with Genuine Joe Solutions air freshener refills only (sold separately).